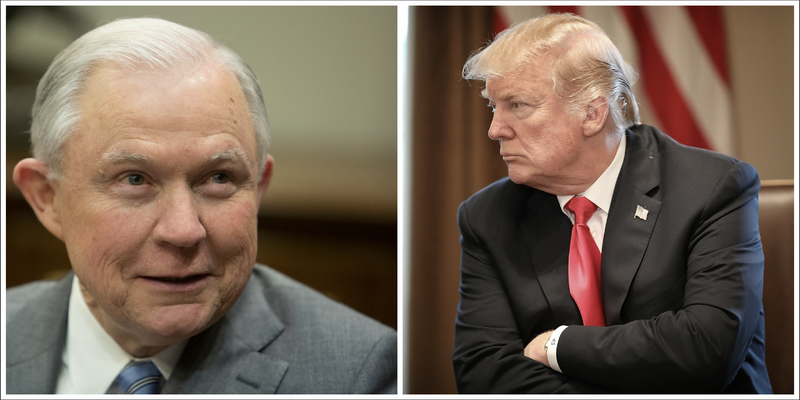 Donald Trump picked Jeff Sessions to be the attorney general of the United States, but he quickly turned on him when Sessions recused himself from the Russia investigation. Since that time, Trump has openly antagonized, insulted and bullied Sessions, both in conversation and on social media. Sources have told the Washington Post that special counsel Robert Mueller has taken a keen interest in Trump’s belittling of Sessions. Specifically, Mueller wants to know if Trump has been attempting to drive Sessions from his job and whether that is part of a pattern of attempted obstruction of justice. Mueller’s team has reportedly questioned witnesses in recent months about Trump’s comments and state of mind when he wrote negative tweets about Sessions in July and August of last year. Was Trump trying to push Sessions out so he could appoint someone else who could control the Russia investigation? That is what the Mueller team seeks to find out, according to the Post. According to the Post, Trump calls Sessions “Mr. Magoo” behind his back. For his part, Sessions is reportedly determined not to resign. I’m glad Mueller is going over all of Trump’s business with a fine-tooth comb. Please find something on this man, his vice president and anyone else you can take down with him. In the meantime, family, Mr. Magoo vs. Mr. Heat Miser (aka Trump)—who you got?